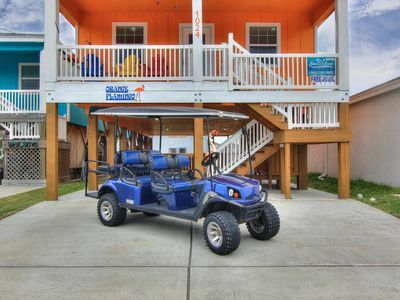 THE 1st FLOOR OF THIS BEACH HOME HAS A PRIVATE BEDROOM, A LIVING ROOM WITH 3 RECLYNERS, AND A FULL SIZE KITCHEN. THE MASTER BEDROOM FEATURES KING SIZE BED WITH SERTA PILLOW TOP MATTRESS, 19 ' LCD TELEVISION WITH 78 CABLE CHANNELS, ALSO THIS BEDROOM HAS A BEDROOM VANITY, WITH SINK AND PRIVATE ENTRANCE TO THE BATHROOM. 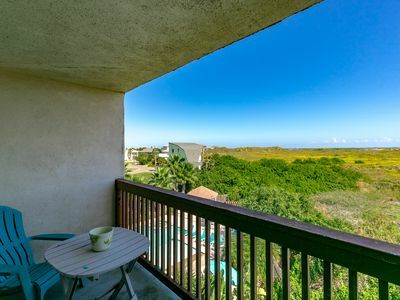 THE 3rd FLOOR OF THIS BEACH HOME SLEEPS 6-7, THERE ARE 2 BEDROOMS, THE MASTER BEDROOM HAS KING SIZE BED, WITH SERTA PILLOW TOP MATTRESS, ALSO 19' LCD TELEVISION WITH 78 CABLE CHANNELS. THIS BEDROOM ALSO HAS PRIVATE BATHROOM WITH 2-SINK VANITY, AND WALKIN SHOWER, THERE IS ALSO ACCESS TO THE OUTDOOR DECK. INCLUDED ON THIS 3rd FLOOR, IS ANOTHER BEDROOM THAT HAS 2 BUNK BEDS WHICH SLEEPS 4, ALSO THIS ROOM FEATURES 15' LCD TELEVISION WITH 78 CABLE CHANNELS. ALL BEDROOMS HAVE CEILING FANS FOR YOUR COMFORT, AND ALL FLOORS HAVE SEPARATE AIR CONDITIONING, AND HEATING UNITS. 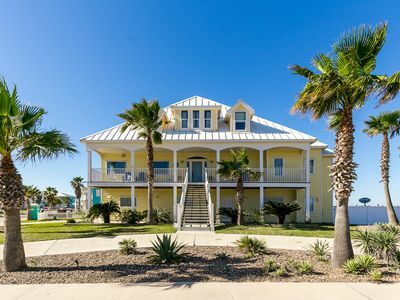 THE 1st FLOOR OF THIS BEACH HOUSE HAS A PRIVATE KITCHEN, 42' PLASMA TV, 78 CABLE CHANNELS, WI-FI INTERNET, DVD/CD PLAYER, ICE MAKER, BATHROOM SHOWER, AND PRIVATE DECK UNDER CARPORT AND ALONG THE BACK SIDE. THE OUTDOOR SHOWER IS UNDER THE CARPORT, ON THE FRONT OF THE FIRST FLOOR EXTERIOR WALL. THE PASSAGE DOOR IS LOCKABLE FOR LOWER AND UPPER UNIT RENTALS. 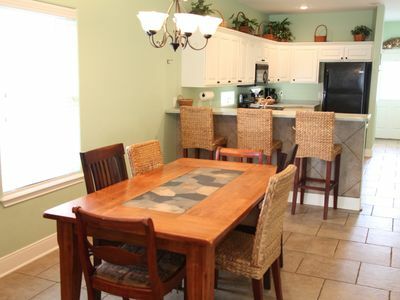 THE 2nd FLOOR OF THIS BEACH HOUSE, HAS A MAIN KITCHEN WITH GRANITE ISLAND, 5 BURNER GAS STOVE TOP, BUILT-IN OVEN, MICROWAVE, ICE-MAKER, LEATHER SECTIONAL SOFA, DINING ROOM TABLE, BATHROOM TUB/SHOWER COMBINATION, ALONG WITH 2 VANITIES AND SINKS, 42' PLASMA TELEVISION WITH DVD/CD PLAYER, WI-FI INTERNET, PRIVATE PHONE, AND SLIDING GLASS DOOR TO THE 550 SQ FT OUTSIDE COVERED TILED DECK, WITH GREAT GULF, BEACH, SHIP CHANNEL AND BAY VIEWS. OUTDOOR FURNITURE IS PROVIDED. 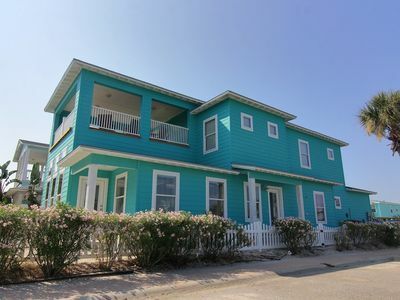 THE 3rd FLOOR OF THIS BEACH HOUSE, HAS A LIVING ROOM, 42' PLASMA TELEVISION, 78 CABLE CHANNELS, DVD/CD PLAYER, SECTIONAL SOFA, WET BAR WITH FRIG, COMMON BATHROOM, GAME TABLE, AND SLIDING GLASS DOORS TO A COVERED TILED DECK WITH FANTASTIC GULF, BEACH, BAY, AND SHIPS CHANNEL VIEWS, WITH VERY ROMANTIC SUNSETS AND SUNRISES. ALL LIVING ROOMS HAVE CEILING FANS FOR YOUR COMFORT, ALL KITCHEN AND WET BAR CABINETS HAVE UNDER AND ABOVE LIGHTING. THERE IS COMMUNITY POOL, HOT TUB, AND B.B.Q. GRILL AREA DIRECTLY ACROSS THE STREET FROM THIS BEACH HOME. WE ALSO FEATURE A PRIVATE GRILL ON THE FIRST LEVEL. THIS HOME IS 750 FT. FROM THE BEACH. BEACH WALK OVER IS PROVIDED. THE ONLY BEACH BAR AND RESTAURANT ARE DIRECTLY ACROSS THE WALKOVER. 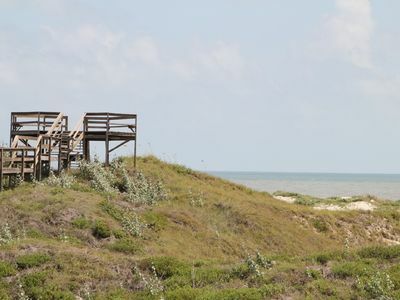 WHEN BUILDING A BEACH FIRE LARGER THAN 36', YOU WILL NEED TO GET A PERMIT FROM THE CITY OF PORT ARANSAS. REMEMBER YOU DO NEED TO HAVE A OCEAN FISHING PERMIT FOR COASTAL FISHING. 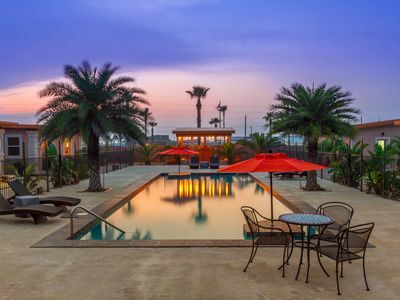 THE TROLLY PICK UP IS AT 11TH STREET, JUST 800 FEET FROM THE SEAPARROT BEACH HOUSE, SCHEDULES ARE FOUND ON THE INTERNET OR FROM THE CITY OF PORT ARANSAS. ALSO REMEMBER THERE IS A PERMIT FEE FOR PARKING ON THE BEACH WITH YOUR CAR, THE FEE IS $12.00 AND CAN BE BOUGHT AT VENDORS ON THE BEACH. 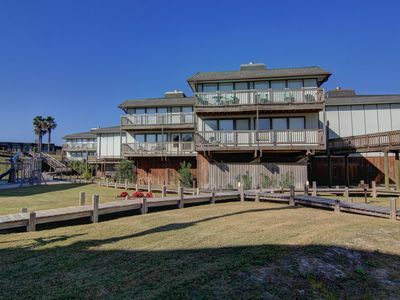 THIS HOME IS 5-10 MINUTES AWAY FROM ALL THE FANTASTIC RESTAURANTS, SHOPPING, FISHING , DOLPHIN WATCHING, FERRY BOAT CROSSING, AND GOLF CART RENTALS. 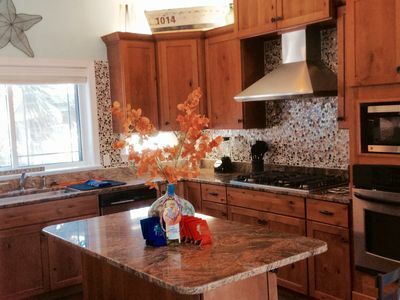 THIS BEACH HOUSE, FEATURES UPGRADED TILING, FLOORING, CABINETS, AND GRANITE COUNTERTOPS. 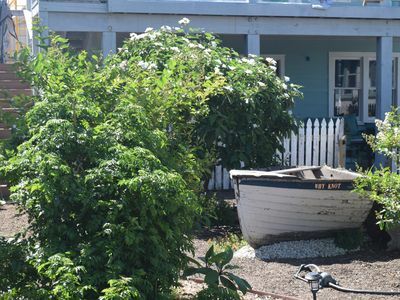 THIS BEACH HOME ALSO FEATURES NAUTICAL DECOUR THEME. 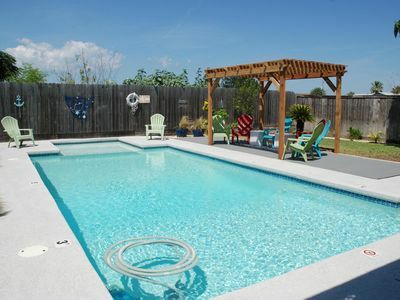 WHILE YOUR ON THE COVERED TILE DECKS, YOU CAN LISTEN TO THE SOOTHING GULF WAVES. WE ARE SURE THE SEA PARROT WILL BE YOUR VACATION DREAM. 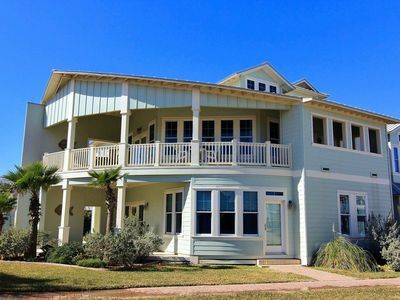 THIS BEACH HOUSE IS NON-SMOKING AND NO PETS. Family Friendly Quite Neighborhood-Directly Across From The Pool! 4 bedroom/4 1/2 bath home! In town with 2 community pools! Pearl On Park Place !